Even as a youngster Kurt Hickethier was fascinated by Dr Schuessler’s form of mineral therapy, the Schuessler cell salts. He took up Schuessler’s basic ideas and from 1910 onwards he started researching facial diagnostics with untiring enthusiasm. Nearly a decade later he went public with his results, causing a sensation. During WW1 he fell sick with malaria and the untreatable Bekhterev’s disease. This enabled him to test the efficacy of the facial diagnosis and cell salts on himself. The disease went into remission and he lived symptom-free for another 40 years. In 1921, during a large-scale experiment in Halle on the Saale, Hickethier applied facial diagnostics for the first time, with great success. He was one of the co-founders of the biochemical association in the area. The facial diagnostics technique acted like a magnet and brought thousands of people into contact with it. In 1926 Kurt Hickethier opened a Schuessler clinic in Ellrich in the southern Harz area. Hickethier left his career in the police force in order to direct the first biochemical sanatorium in Germany. This allowed him, on a daily basis, to further research and test the accuracy of facial diagnostics, developing valuable descriptions of the characteristics of individual facial signs. These signs remain unique and ground breaking. If you understand German, you can read about Hickethier‘s insights in his books, which have been republished several times and are still available today: “Lehrbuch der Biochemie”, “Sonnerschau, Lehrbuch der Antlitzdiagnostik” and “Woran erkennt man?”. In 1934 Hickethier opened another sanatorium in the Clettenberg Castle not far from Ellrich. In 1938 he was denied work for political reasons by the Nazi regime. His two sanatoriums were confiscated and his books taken and destroyed. Apart from facial diagnostics, Hickethier also developed the Hickethier sight training method, the Hickethier health baths and a spinal care system, which involves a special nerve massage. He was forced to flee to West Germany in 1947 following dispossession and persecution by the Soviet occupation force. Here he made a new start with his most loyal colleagues. In 1951 he started providing a clinic and seminars in the Bruchhauser Mill in Dies in the Gelbach valley. A new Naturopathy Centre was built in Kemmenau in 1957. Unfortunately Hickethier died shortly before completion of the building. 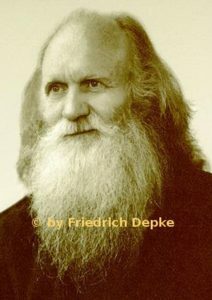 His life work was carried on by his co-workers Charlotte and Luise Depke.